Selecting and installing new windows may seem like a pain in the neck, but they can be well worth the effort and cost. A new set of windows adds aesthetic value to your home’s exterior, boosting your property value and personal enjoyment. They are also much more convenient when it comes to maintenance, and can help you avoid visible smudges and stains. Best of all, they can help lower your monthly utility bill, reducing drafts and improving your home’s insulation. Get in touch with Berg Home Improvements to shop our selection of vinyl and wood replacement windows today. Easier to Clean – If you have older windows, cleaning the exterior can be an undertaking. If you’ve found yourself stretching your arm through an open window or even standing outside on the upper floors of your house, window replacement is right up your alley. Many of our windows include tilt-in features which allow your window to swing inwards for easier cleaning from INSIDE your house. Better-looking – If your windows are outdated, or you have made external improvements to your house, a new set of windows can tie the place together, especially if your home currently features ugly or outdated windows. Energy Efficient – The industry has made many leaps in energy-efficient window technology in the last decade. If your windows were installed decades ago, they are probably less efficient than new vinyl or wood replacements. A few years with energy efficient windows and the replacement tends to pay for itself. These are some of the most popular reasons you might want to replace your windows, but there are plenty of other factors you can consider. Contact Berg Home Improvements to learn more; we can assist with selecting and installing your new windows. 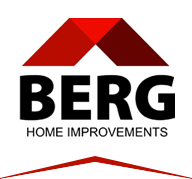 At Berg Home Improvements, we are a fully licensed and insured business with over a half-century in the roofing and home improvement business. We carry a wide selection of both vinyl and wood replacement windows from industry leaders like Midway Alliance, Marvin, Provia, Pella and more. Whether you are looking for Single Hung or Double Hung, picture windows or something else entirely, we can help! You can see the innovation in window installation in our past projects, and we’re also happy to offer front entry and patio doors. If you are looking for practical, economic and innovative window replacement, you’ve come to the right place! At Berg Home Improvements, we can help your home or business with our wide range of both wood and vinyl replacement windows. You can reach our window replacement experts by calling us directly or by leaving us a message online. Whether you are looking forward to improving your home’s insulation, or are tired of neglecting the outside of your second-story windows, we can help!